The “Mr. Cool” of Eminent Air Boxing Gym/Sagami, with a wardrobe of hip hop wear and a range of breakdancing moves, Jomhod Sagami has been a star of the Muay Thai scene in Thailand for a number of years. Although he has yet to achieve the worldwide fame of the likes of Buakaw Banchamek or Yodsaenklai Fairtex, for example, increased international recognition is surely due his way after he takes on hard-punching American Romie Adanza on the M-ONE Reborn promotion on May 16th at San Manuel Casino, California, USA. 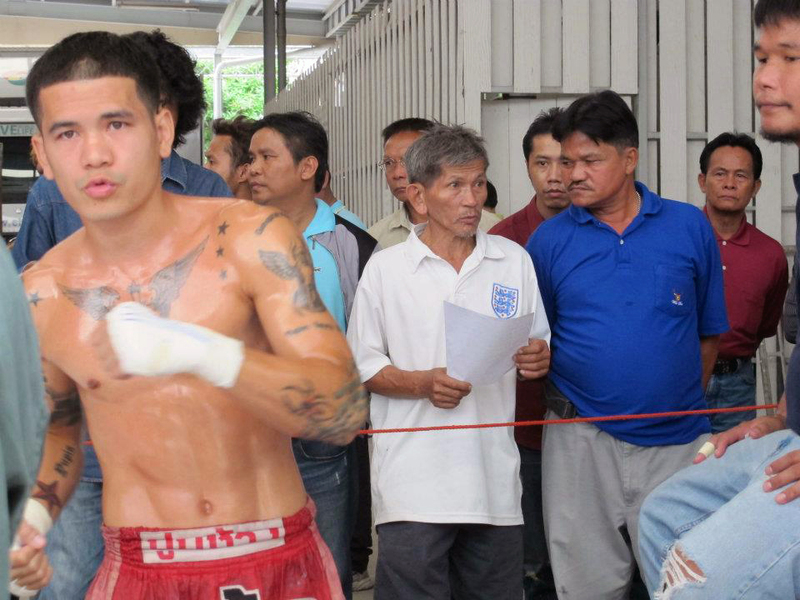 The fight in America will top off a busy few weeks for Jomhod, after matches with Kusagonnoi Sor Joonasen at Lumpini on April 5th (win TKO round 3) and old adversary Pentai Singpatong at Bangla Boxing Stadium, Phuket on April 28th (points win). I took a few minutes out of Jomhod’s training for his most recent fight with Pentai to ask him a few brief questions on his Muay Thai career, then captured him training for a round on the focus pads. Although my camera is rather unsophisticated and my filming certainly amateur, the skill and fluidity shown by Jomhod as he works with his padman remain clear for all to appreciate. I come from Ubon Ratchathani. At what age did you have your first fight? Did you win or lose? What was the prize money? I was 9 years old. I won and earned 200B! Why did you start training Muay Thai? My father used to fight so I followed him into the sport. How long have you been based at Eminent Air/Sagami? How long have you been training with your padman Kompetch Senaphitak (Ajarn Len)? Umm, I can’t remember exactly….a long time. I started training with him before I came to Eminent Air/Sagami, when I was a boy. 122 fights, 97 wins, 20 losses, 5 draws. Which titles have you won? 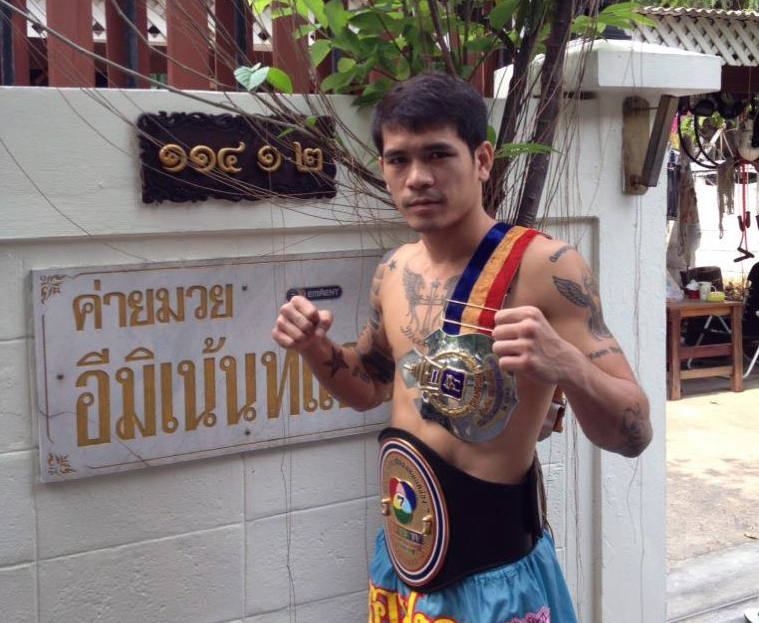 A Channel 7 title at 108lb, an S-1 title at 105lb, and an Isaan title at about 30kg. You have also fought pro boxing. How many fights did you have? Why did you stop competing in this discipline? Because I prefer Muay Thai! Which fight you are most proud of? When I won the 108 lb Channel 7 title against Nampet Sor Tanthip in 2008. On May 16th you will fight US fighter Romie Adanza for the 115lb WBC title in California, USA. Have you ever fought a foreigner before? Have you ever fought overseas before? No. I’m very happy to have the opportunity. If you could have further overseas fights, in which countries would you most like to compete? Which fighter(s) are you a fan of? Who do you like to watch in the ring? Thanks. Will the fight be televised to Thailand? Any chance of seeing clip of Jomhod’s latest fight against Romie Adanza? I heard that he easily elbowed his opponent to submission. I haven’t seen any link yet but I’ll be sure to post it if I do see one. Easy day at the office – over in less than 1.5 minutes!